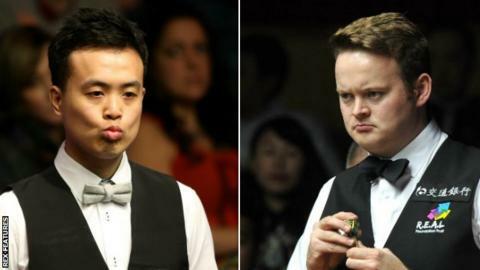 Shaun Murphy joked that Marco Fu must dislike him after the world number 14 ended his UK Championship run for the second successive season. Fu won a thrilling, but increasingly nervy, last-16 match 6-4 against the world number four at the York Barbican. The Hong Kong potter also beat 33-year-old former world champion Murphy at the same stage last season. "He is a very good player and he always seems to play really well against me," Nottingham-based Murphy told BBC Sport. "I really like Marco. I am not sure he likes me that much." Fu made breaks of 93 and 104 to go in 2-2 at the interval and, despite falling behind, two successive 50s saw him build a 4-3 lead. He closed out victory against the man who beat him 10-9 in the 2008 final to set up a meeting with either Liang Wenbo or Tom Ford in the last eight. Fu, a two-time ranking event winner, said: "It was a high-quality match, especially at the beginning. "We both scored very well, our attacking game was spot on and we both took our chances. "Shaun started to feel the pressure when I was leading 5-3 so we were both missing a few too many towards the end. "I saw the winning line and I was a little bit nervous. I needed Shaun to miss a few and was glad to get over the line. "It is always nice beating a player of Shaun's calibre but last year I beat Shaun and got carried away because beating him was a big achievement. "I didn't really recover. Hopefully this year I will not make the same mistake."